One hundred years ago today, the world had just 10 days to go before the assassinations that would spark the Great War, World War I.
I’ve tossed around, even blogged about ideas such as daily blogging events of the day 100 years ago today, etc., but I’ve found that without the carrot of a paycheck, it’s sometimes hard to motivate myself to really work on a regular daily blog post or a series of posts. But I still survey news from 100 years ago each day, using Newspapers.com (pay service) and the Library of Congress’s collection of historic newspapers, which is free for anyone to use. I pin or tweet some of the stranger, funnier things and have posts here about stories that were particularly interesting and begged more research. What comes home again and again as I read–and I also check out English and various European publications where available–is this was a world unaware. 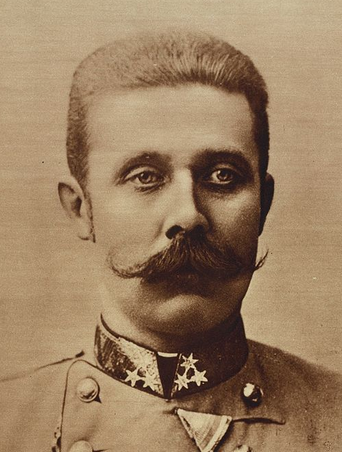 Most books about World War I touch on this right away, how the conflagration that arose from bullets fired into Austro-Hungarian Archduke Franz-Ferdinand and his wife Sophie, Duchess of Hohenberg, quickly spiraled into a horrific wildfire. 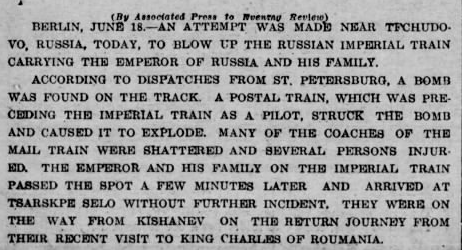 Something about the prosaic nature of the news of 1914 prior to June 28 slams the point solidly home… though I’m sure none of it seemed prosaic at the time. In London, the ongoing concern was women’s suffrage. English women seeking political franchise in the early 1900s were absolutely badass and took no prisoners in their drive to get the vote. In the first 6 months of 1914 they were regularly bombing, slashing, marching and beating their way into the public eye. 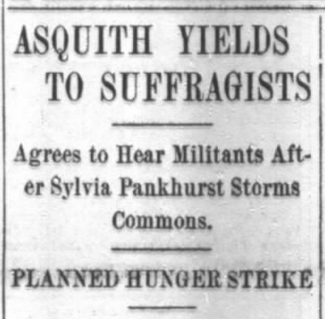 On June 18th, English Prime Minister Asquith finally assented to a meeting with a deputation of protesters, in part to avert their leader’s hunger strike. Just as the world’s eyes are on the World Cup today, American and English papers were paying close attention to the International Polo Cup. The English had just defeated the American team on June 15th, and the rivalry wasn’t all that friendly in print. Blurb from the Wilmington, NC Morning Star, pubbed 6/19/1914. 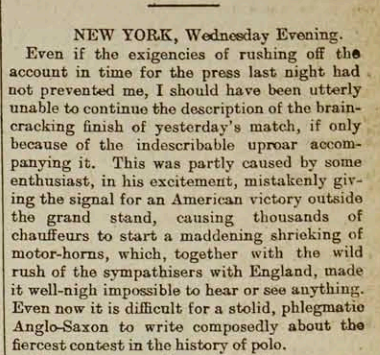 An English account of the victory made it sound as if all those polo grounds were missing was vuvuzelas. A strange murder trial which involves difficult psychological problems was commenced at Elberfeld recently. The defendant, who is indicted on the actual capital crime, is Brunhilde Wilden, an attractive girl of 21 years, belonging to a substantial Dusseldorf family. By her side in the dock stands a medical practitioner, Dr. Nolten, her fellow-townsman, who is charged with having incited and abetted her. It was believed Brun(n)hilde had become involved with Dr. Nolten but maintained her relationship with the other doctor, whom she was accused of killing. And in France, the papers and the populace were still consumed, as they would be until Franz-Ferdinand’s assassination on June 28, with the ongoing murder trial of Mme. Henriette Caillaux. 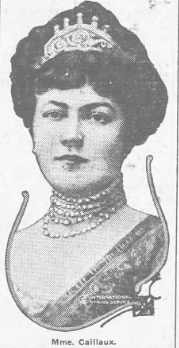 Madame Caillaux had murdered newspaper editor Gaston Calmette in March, 1914, and her prosecution was a trial of the century sort of event for France at the time. So the world was cranking on, as it will do. As it does today. There were skirmishes and battles elsewhere, in the Balkans, in Greece. In the United States, the constant slow boil of conflict with a turbulent Mexico to the south seemed to be sorting itself out… but no one was sure, yet. Depending on the paper and its editorial bent, war with Mexico was either still imminent or the threat was finally on the wane. There were rumblings and explosions and murmurs and rumors, but no one knew the white-hot burst of fury to come. I am perhaps too obsessed with the concept of history not precisely repeating, but rhyming. That’s why I’m so drawn to examining events a century ago and sometimes finding parallels. Or, where there are no direct parallels, at least asking the question: are we unwittingly closing in on some kind of flashpoint, as well? It would be too bizarre for it to happen precisely 100 years later; no one can believe that and be entirely sane. Yet sometimes I wonder if we’re both living in a world with that potential and if there’s some unexpected place where it will occur. Interesting as some of the things dominating the news 100 years ago today might have been, there were no portents. The world was humming along in a certain rhythm. There was mayhem, murder and calumny, but no one smelled the blood, mud and gunpowder to come. If history does rhyme at all, even slant rhyme, this should keep us on our toes today. It might be okay to be a little bit nervous.